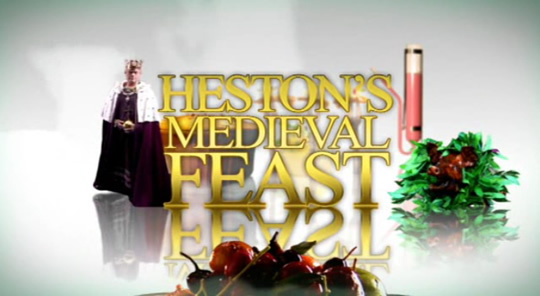 The latest episode of Heston's Feasts had Heston Blumenthal exploring the Medieval era for recipes— the Middle Ages, he reminds us, was a tough time, what with a life expectancy of 25 and the Black Death killing 60% of Europe's population. Of course, the wealth distribution was totally out of whack, and the royalty indulged themselves by having their chefs perform gastronomic trickery to entertain their guests. 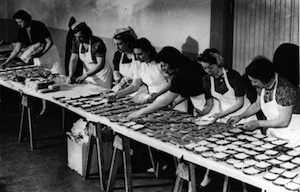 Blumenthal's menu: Lampreys served with a blood cream sauce made in a centrifuge, sea foam, and a deep-fried lamprey's spinal column; four and twenty blackbirds baked in a pie (actually a gigantic pie with pigeons flying out of it); and then a tromp l'oeil where he replaces all the cutlery, napkins, and candles on the table with an edible substitute. When I first started looking at historic recipes, particularly recipes from medieval times, there was one dish that really attracted my attention, just because it was completely mad: Meat fruit. Literally, you took some meat and literally turned it into fruit. 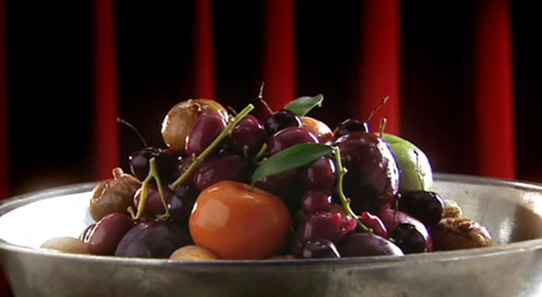 People in the Middle Ages believed raw fruit and vegetable were considered to have diseases unless cooked. With a typically wicked sense of humor, medieval chefs played on this fear by forming and painting meat to look like raw fruit. And Blumenthal runs with it, like the mad scientist he is. He takes bull's testicles, also known as bull's plums, and turns them into fake plums. "I love this idea, a trick on a trick on a trick... I'm using plums to make plums." But he doesn't stop there, making mandarins out of chicken livers, apples out of minced pork, and bunches of grapes out of Parma ham. And thus, the meat fruit bowl.